Is a bad knee getting in the way of the things you love? How Do I Know If I Need Knee Replacement Surgery? That’s a question you and your orthopedic surgeon will have to answer together. But when knee pain is so bad it actually interferes with the things you want or need to do, the time may be right. Knee replacement may be an option when nonsurgical interventions such as medication, physical therapy or other walking aid no longer help alleviate the pain. Other possible signs include aching in the joint, followed by periods of relative relief; pain after extensive use; loss of mobility; joint stiffness after periods of inactivity or rest; and/or pain that seems to increase in humid weather. 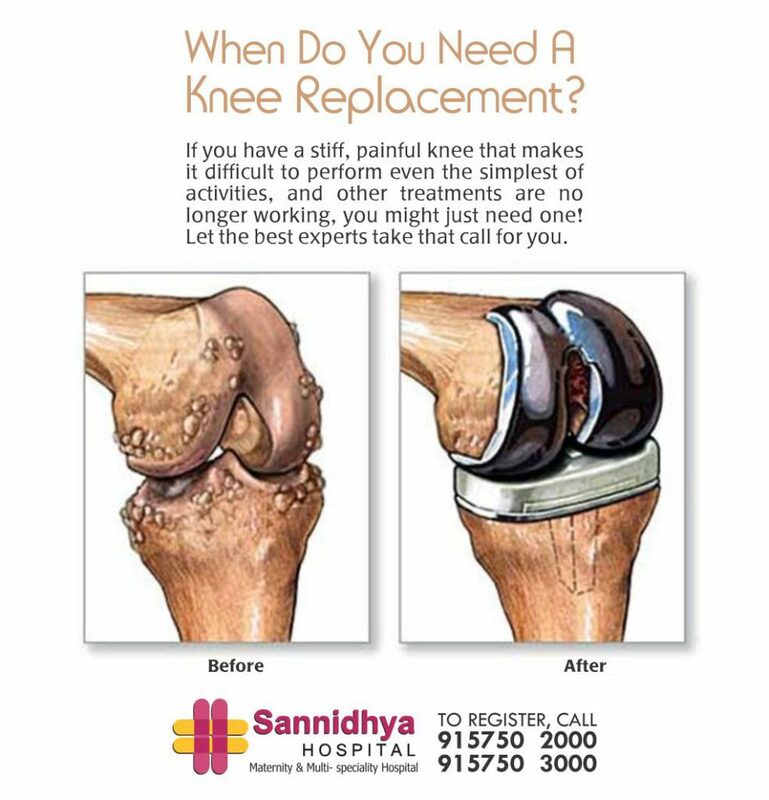 Sannidhya Multi Speciality Hospital is best affordable cost joint replacement surgeon and knee replacement surgery doctor hospital in Ahmedabad with near area like Satellite, South Bopal, Shilaj, Bodakdev, Paldi, Prahlad Nagar, S G Highway, Ashram Road, Ellis Bridge, Navrangpura and all over Gujarat. Knee osteoarthritis develops over time and can sneak up on you. When you do begin to experience symptoms, much of the damage may already be done. The finest Centre for Bone & Joint Replacement at Sannidhya Multi Speciality Hospital, South Bopal, Ahmedabad is equipped with advanced infrastructure and backed by a proficient medical squad at Sannidhya Multi Speciality Hospital offers comprehensive care including clinical and therapeutic services for all kinds of bone related diseases. For more information Consultant our Senior Consultant Joint Replacement Surgeon.